School may have been out for the summer but it was in session for a group of dedicated Indian River County teachers who chose to give up a week of their summer vacation to attend a week-long, literacy-intensive teacher institute hosted by The Learning Alliance (TLA). 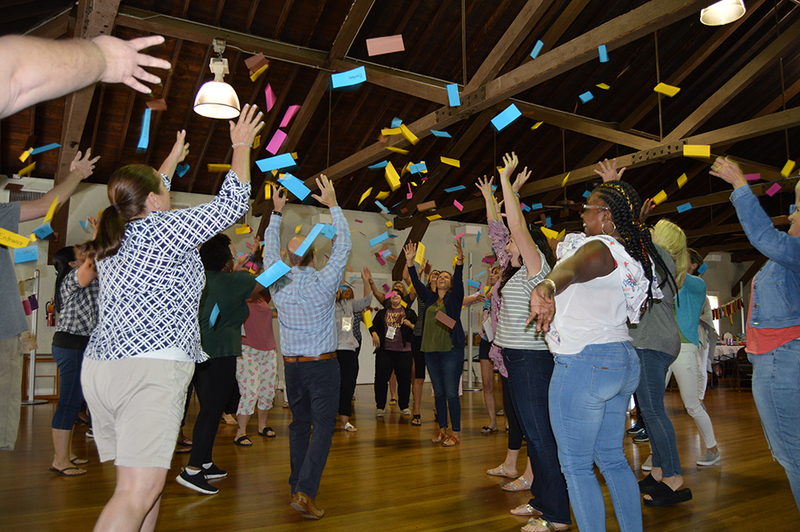 The Moonshot Summer Teacher Institute offered a free professional development opportunity for elementary school teachers by immersing the educators in a model classroom experience. Featuring the inspirational story “Malala's Magic Pencil” by Malala Yousafzai, the teachers were exposed to research-based strategies. By providing authentic opportunities for applied learning, the teachers witnessed firsthand how to develop foundational literacy skills. “We need to be intentional when we teach to make sure that kids are making connections. Connections to each other, connections to the content, connections to the classroom,” said Liz Remington, TLA co-founder. TLA facilitators modeled best practices through Enriched Literacy instruction in a learn, do, reflect model. This model allowed attendees to experience key aspects of Social Emotional, Foundational and Applied Literacy as a student and then to “unpack” the experience through peer interaction and discussions. “This professional development experience is different from others that I've attended because it is hands-on learning for teachers. It's immersive for teachers. It encourages us to get up and participate rather than just sitting and listening,” noted Cindy Gibbs, Beachland Elementary School third-grade teacher. Part of The Learning Alliance mission is to foster a literacy culture that focuses on the community Moonshot Moment Goal to have 90 percent of children reading on grade level by third grade. “To meet this goal,” Remington continued, “we need to give kids authentic, meaningful experiences.” That's why TLA simulates the classroom experience, so the teachers know what it would feel like and what a model classroom could be. “We celebrate and honor the teachers and give them a week to just go deep with literacy and give them some knowledge, skills and opportunities to reflect on their practice and how to bring it back to the classroom,” explained Remington. The Summer Institute was made available to Indian River County teachers through the generosity of The Learning Alliance and Moonshot Community partners. The Learning Alliance was joined by Quail Valley and the TLA founders in sponsoring the institute. “This is really a gift of the investors in this community and their commitment to literacy and to our educators. We really want to help them improve practice so they can meet the challenges of the kids that are coming into their classrooms,” shared Remington. “When I attend The Learning Alliance workshops, I am always learning new, research-based strategies that apply meaning behind learning. The strategies are playful yet intentional. Our students need to know how to make connections to the text and the world through literacy, and The Learning Alliance does this,” shared Amy D'Albora, literacy coach.